Yesterday Michael Christiansen (pictured) won the 2014 Hawksworth Young Chef Scholarship Foundation competition, held at the Pacific Institute of Culinary Arts in Vancouver, BC. 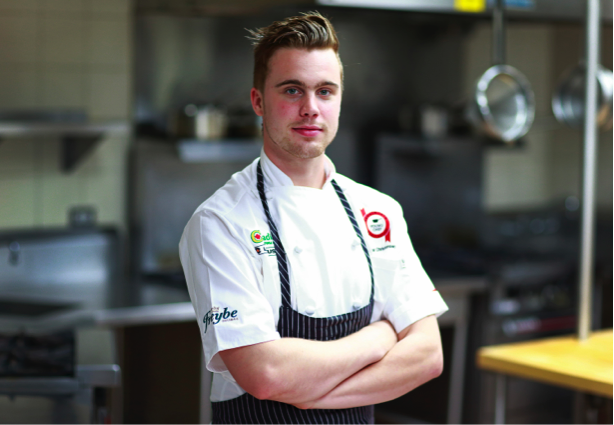 The 23-year-old, originally from Winnipeg, stood the heat of the kitchen to beat finalists from across Canada for the $10,000 prize presented by Chefs’ Table Society of BC and a stage at an international restaurant of his choosing. During yesterday’s final, Michael cooked alongside seven other contestants – each finalist created a recipe using ingredients from the Freybe Mystery Black Box which were only revealed that morning, and presented their dishes to the panel of Canada’s most revered chef judges. Michael made it to the final three with 26-year-old Stephen Baidacoff and runner-up 24-year-old Corey Hess, who was named Le Creuset’s Rising Star. Michael’s main dish and dessert wowed the panel of judges, as both creations, including his lingcod, were exceptionally clean and well balanced. He also won points for his technical ability, judged by Hawksworth Restaurant’s Chef de Cuisine Kristian Eligh and Chefs’ Table Society of BC President, Chef Scott Jaeger in the kitchen. Michael scored top marks from the judges during a taste test by a panel that included: Chef David Hawksworth, Chef Michel Jacob, Chef Normand Laprise, Chef Anthony Walsh, respected Canadian food writer Jacob Richler and La Presse’s restaurant critic Marie-Claude Lortie. “The calibre of the young chefs this year has been extraordinary and all of the judges have been impressed by the dedication, passion and creativity they showed in the kitchen,” says Chef David Hawksworth. “We created this national competition to find the top young culinary talent in Canada and we’ve found it in Michael. I’d like to thank all of the judges for giving their time and sharing their expertise with these emerging chefs as well as providing them with the inspiration to take their culinary careers to the next level.